See picture left to right: Geoff Sharpe, Head of Corporate at Danske Bank, Tom Ekin, Director of Weavers Court & Brian Shane, Corporate Banking Manager at Danske Bank. Up to 480 jobs could be supported as part of a major £8m redevelopment with us here at South Belfast. 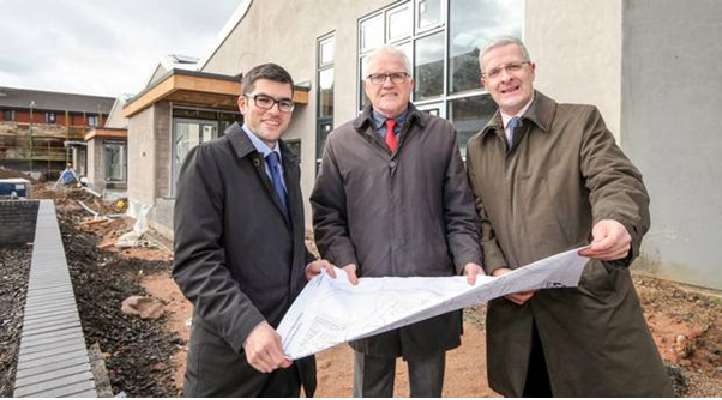 Weavers Court Business Park is set to complete the expansion of three industrial units next month. Building is well under way on another 40,000 sq ft grade A Office Building due to open Spring next year. Our planners continue researching technology parks in Europe and the US to develop and expand our ‘campus style’ hub for new and expanding businesses. With 40 tenants including firms specialising in cyber security, Weavers Court has become known as a city hub for IT companies. ANOTHER FIRST FOR WEAVERS COURT, TOM EKIN’S IDEAS HAVE BORNE MORE FRUIT!